The A1200 Team and myself are happy to share with you our third Crowdfunding campaign. The campaign is now in USD. Previous campaign for the keycaps was in SGD. This wasn't easy for some backers to notice right away. One of the many advantages moving to Indiegogo was the option to chose the USD currency, alongside a bunch of other features they offer. Things that are not possible on Kickstarter. The purpose of this new campaign is to create new molds for Amiga 500 computer cases. With the Team we've decided to go for the A500+ case design with its larger badge. Since we'll provide nice Metal badges. The molds will carry out the case shells, but also expansion doors, and Apollo Vampire ports adapter, Vampire V4 cradle and if everything goes as planned with the last stretch goal; Replacement shells for Tank Mouse will be available too. As the bulk of the stress for the keycaps is now over. We know we have the design and materials down. And are now waiting for our production slot and then go into labeling. And this is 100% outsourced to our manufacturing partners. The campaign will last 45 days. - It can be expended to 60 days if necessary. - Just send a message after your first pledge and we'll get back to you. - This will happen after all keycaps backers have received their rewards. Thank you again for your support and for helping us to continue and renew necessary parts of the Amiga classics. The case is 1:1 original. are you ever going to redo the A1200 the same way? Phil, the new run of keycaps for A500 will include the original color of keys belonging to A500 keyboard? 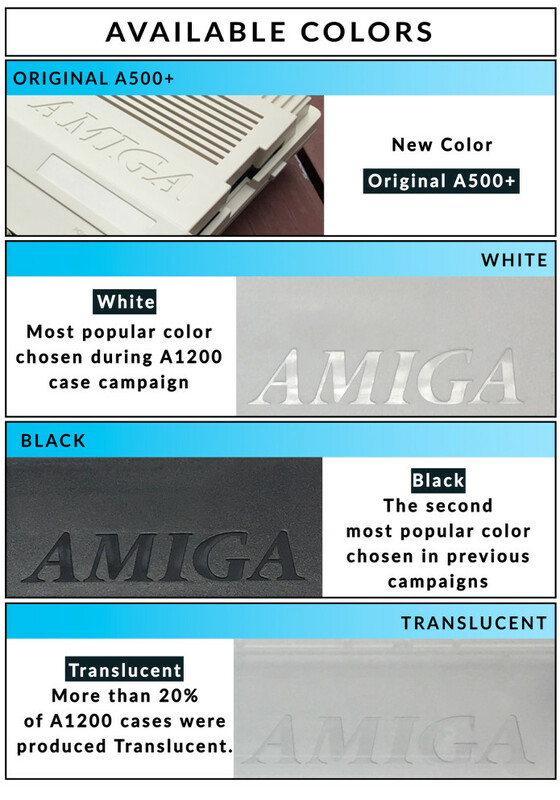 The Team added an "Original Amiga 500(+)" color for the A500 case campaign. It will be the same for the next run of keycaps with a "Original A500(+) Keycaps set Theme"
The campaign has ran for a full week now and it reached 33% of its Goal. To all other Amigans do not hesitate to support and pledge on your desired Amiga 500 case. 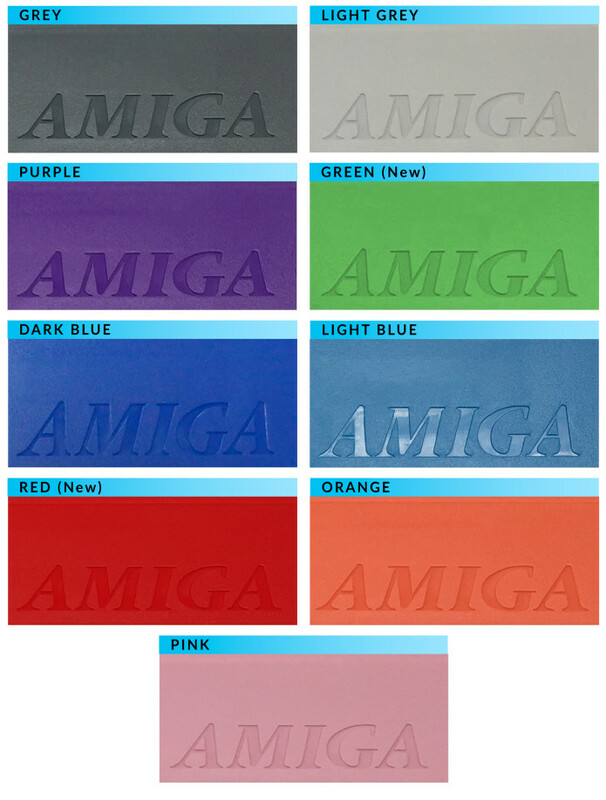 This will help us to create new molds for Amiga 500. Already pledged for 2 keyboards! Also have the crowdfunded A1200 case all have been delivered? I just don't get why after having made the molds, allegedly the most expensive/hardest part of the process ,we can't buy A1200 cases like the C64 new case people allow, but you are producing yet another type of case. Don't mean to rub you wrong with my questions, I just feel like this is all a bit weird, and I for one and am sure MANY who couldn't/wouldn't back the A1200 project originally, would want to have a case and/or new keycaps now after what, your second successful crowdfunding campaign? And wouldn't selling new cases also help you finance new R&D for products like this? And maybe even, hopefully, make some well deserved money? Good job on the effort, as always, though. I know it isn't hard to come up with these. I just wish you would maybe make me feel like the cycle for previous crowdfunded projects has ended fully and successfully(with the possibility for anyone to buy new cases today) so you can focus on a new one. It makes little sense to start a new production right now that the project is still so fresh and there's still leftovers. And I'm sure the key caps are very close to being on the way. Even backers have not received them yet, so surely they will not make new ones right now. It also took a little while until someone picked up the C64 molds and manufactured some new cases. You beat me to it haha. I figured I'll detail a bit more as to -why- it took time for A1200 cases to hit the shelves. And yes keycaps mass production is at the corner, we're just waiting the last keycaps set sample with correct labels. Thanks Demolition, and thank you for your support! Thank you for your comment Akira. It was never a question for the team to distribute cases directly by ourselves and through our website. Instead we wanted to manufacture cases for wholesalers and Amiga dealers, online & physical shops. This information is available on the FAQ page within the "Where to Buy?" section. And we also have a "Where To Buy" page on team's website! Distribution takes a lot of time to setup. The reason is that distributors have to estimate how many cases they'd like to order (stock) to the wholesalers. When this long process is done, wholesaler comes back to us with a QTY of cases they like to get (and in which colors). Another important fact is that the team can't produce 10 or 20 cases only. It's an industrial process where to make cases requires a MOQ of 500 cases PER COLOR. And this implies serious production costs. So all in all, distributing cases to Amiga dealers took a long time and there is nothing we could do about that. That's a strange question. Why would they not? All cases have been dispatched of course. The C64c new cases came from existing molds. These cases where produced after a first crowdfunding campaign to just manufacture the cases. Then the molds were sold to Individual Computers in Germany, where they made a new run of cases after adjusting the molds. You have to put the two products timelines side by side, and you'll understand that we do not work the same way. IC is distributing cases by themselves, playing solo. We don't and want to add "value" to the Amiga distribution network. It takes more time and preparation. And that's whats currently ongoing. In fact, New Amiga 1200 cases for distributors are currently being produced as we speak and they'll be on shelves in May! However a bit of reading on the team FAQ page and Where To Buy page would have gave you much answers already, if you don't mind me saying. The Amiga market isn't that big I'm sure you know. Thats the reason why the team goes through crowdfunding campaign. No individual or company would want to invest 130K+ in molds and cases without being sure someone is there willing to take them. Amiga 1200 cases will be available to the market shortly. It's not because a product didn't hit the shelves when you expect them to that it means there's an issue. Please understand the level of industrial processes this requires, and that the team is not Microsoft nor Logitech, those can order factories to do their bidding at will anytime they want. The team is a small player among the smallest players. We literally have to wait our turn for factories to have free production slots for us to process, and we can request such slots ONLY when we know QTY and details of production... Once the wholesalers and distris knows what they want. Hope that is clear for you now. It *IS* hard to come up with these. Or maybe that's a typo? -Cycle for A1200 project is finished as in -done-. -Cases will be available shortly, as I explained already. Thanks a lot for your questions Akira. If I may, you should have followed our projects carefully or visited the teams FAQ page to get all these info. Or at least message us directly, as we answer all emails. The information I just gave you through your questions are well known info. - And thank you for your support on the Amiga 500 case campaign. We need all amigans support to make these molds. The same way we needed all of you to make molds for the Amiga 1200 cases. Totally a damn typo, sorry!!! As for why I ask about the A1200 cases? I am not a backer and I haven't read anything about updates of course. 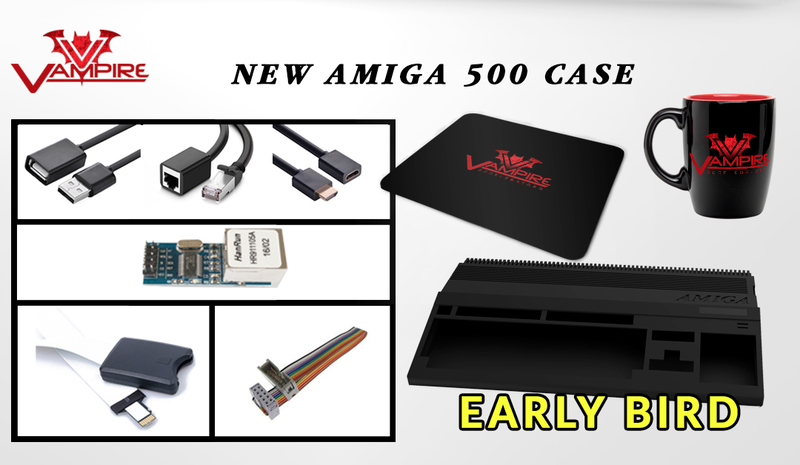 I was Waiting to see the cases pop up in Amiga shops as you said (not direct sale necessarily, sorry if I confused you with that) but as you said they are not ready yet. It's not like I *expected* them to sell at any point, I just thought "it's been a damn long time since that campaign, why are the case still not at Amiga shops?". MEA CULPA on not following your project more deeply, I do get all my news from what you post here at EAB, so thanks for clearing that up. I'm just a generally interested party, I'm afraid I usually just cannot afford realistically this kinda thing for machines I have that already have a case, but I follow as close as I can with much interest and I was a bit puzzled so that's why I asked all that. Thanks for going through the bother of answering the questions. No problem, and thanks for your questions. - You own an Amiga 500? > Renew your case and help to make this great opportunity become a reality. Support the campaign and help! 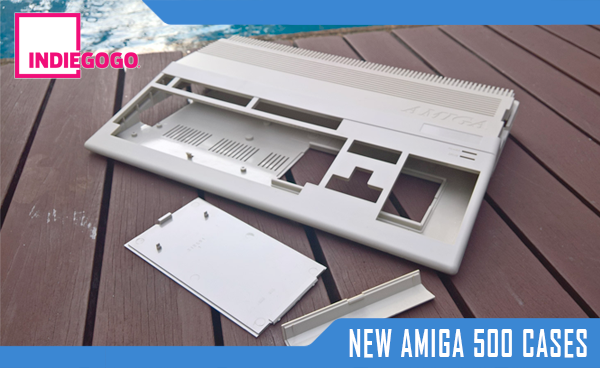 Help and support the Amiga 500 so that he gets his new case the same way the A1200 did! Seems Indiegogo (or the site that hosts it) has blocked IE11? I don't use (nor want) any other browser and Edge is removed from my version of Windows 10 so it's a No Go for Indiegogo!! So what is the difference between the standard case and the "vampire A500"? Is it possible to install a vampire standalone card in the standard "uniqe solo" A500 case? Thank you for your feedback BarryB. You certainly understand that blocking IE11 isn't of our doing. Face it, IE11 is an outdated browser. It is your choice not willing to keep up with modern browsers. ► De-installing EDGE or renaming it's folder in systemapps can lead to instabilities. you can use your mobile phone or tablet, or any other device, to support the campaign and support the Amiga. Last edited by amenophis; 23 April 2018 at 07:15. Yes ALL cases can get the vampire standalone cradle + ports mount. "The Case includes: - Case Metal Badge - Screws for metal inserts - Rubber Feets - Apollo Vampire features "
I know it's a question which has cropped up more than once on the various forums.